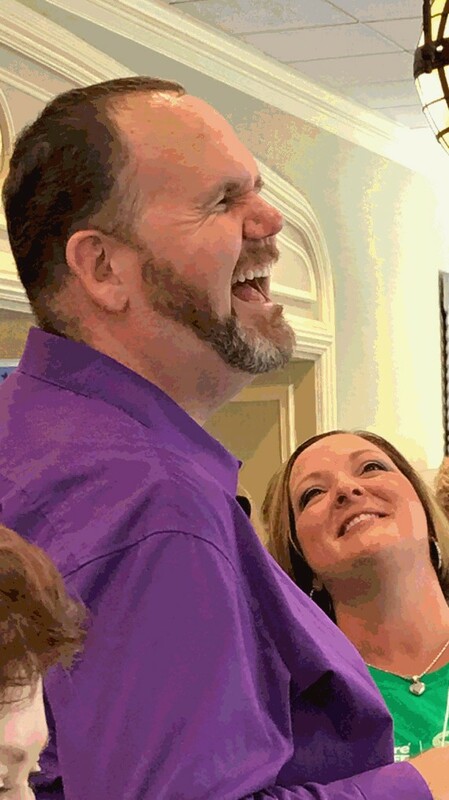 The Carb-Sane Asylum: Keto Klarity Karma ~ All Aboard the Jimmy Moore Livin La Vida Low Carb Drama Express!! 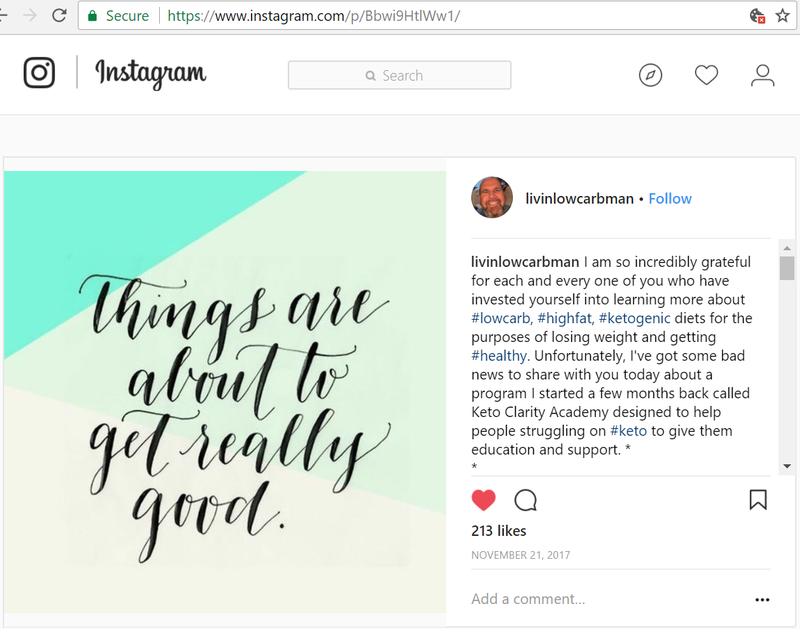 Keto Klarity Karma ~ All Aboard the Jimmy Moore Livin La Vida Low Carb Drama Express!! While it is possibly a royal waste of my time, I do think it is important to keep shining a light on the source of so much information on the internet. Whether it's from Jimmy Moore directly, or through the filters of his podcasts, or the reality that he's an internationally best selling author of health and nutrition books, his level of disinformation cannot go unchecked. Yes ... I like to use the Ks, and let's face it, Mr. Livin La Vida Low Carb Jimmy Moore doesn't shy away from using the Ks himself (see his current public Facebook group: Ketonian Korner). Aside from the inexplicable actions of Victory Belt Publishing rewarding him with evermore book contracts, 2017 wasn't a banner year professionally for Jimmy Moore. Jimmy's last book, The Complete Guide to Fasting, came out towards the end of 2016. Initially this was to be another book in the Clarity series. Those books were both authored by Jimmy Moore, and *with* Eric C. Westman, MD. With the fasting book, at some point, Jason Fung, MD managed not only to get the book retitled, but he actually got the authorship credit. That book ended up being written by Fung and *with* Jimmy Moore. Nonetheless, the Fasting Talk podcast With Jimmy Moore & Dr. Jason Fung Featuring Megan Ramos debuted just before the new year. Jimmy was already doing another podcast with Dr. Adam Nally ("Doc Muscles" LOL) that had debuted almost exactly one year prior: Keto Talk with Jimmy Moore & The Doc. It's important to note that by the time Keto Talk debuted, Jimmy Moore had regained all of the weight he lost during his year long Keto Experiment of mid-2012 to mid-2013. By the time Fasting Talk debuted, the monumental, unmitigated failure of fasting for Jimmy Moore was fully evident. But this is Jimmy Moore's formula, and in exchange for internet popularity these two doctors did their best to lend medical credence to Jimmy's dietary stunts. I've not listened to either in any great length, but I've seen some videos of Jimmy with his two hosts, and it's always uncomfortable to hear them discussing weight loss and either keto or fasting, as if the literal elephant is not in the room. One wonders what they are actually thinking! Fat shaming? Get real. Here's his wife Christine's take, back in 2007. Make no mistake about it, for both Fung and Nally, making money from their "alternate" practices is the bottom line. There's certainly nothing inherently wrong with that, I'm all for making an honest living however one chooses, and nowadays being a traditional medical doctor is no guarantee of a good income that pays off the huge financial investment many made in becoming one. 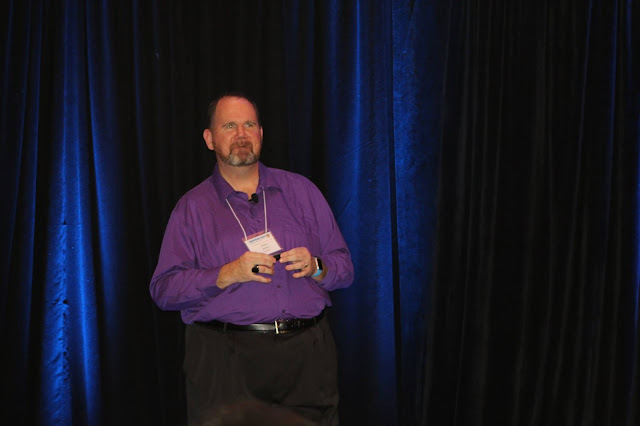 But how you can talk about keto and fasting for weight loss with this guy? 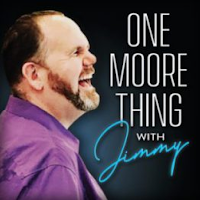 Jimmy Moore began the year with a talk that included him putting his back to the audience and recalling that time when he was a substitute teacher and a kid blurted out "Mr. Moore is sooo fat". Wouldn't you know that he made it a point to tell the audience that said kid was chubby. Hmmmm..... In any case, I'm thinking it got more than a little uncomfortable for him to do this, and put the "fat before picture" up on screen as he is objectively severely, morbidly obese. So in the face of -- again -- very legitimate criticism -- sometime in 2017 Jimmy Moore morphed his talk into one of "everybody is so mean to me on the internet". In everyone else's reality, Jimmy's legitimacy as a co-host of health and weight loss oriented podcasts is a perfectly valid point of criticism as well. I'm not sure what to think of anyone who follows him at this point. Sadly there are still enough to sell books and buy products he promotes -- it's like some alternate reality. I J.U.S.T. D.O.N.'T. G.E.T. I.T. As a Christian man who is far from being perfect, this issue has been weighing very heavy on my heart. The Bible addresses how to handle these situations with others you have conflicts with in Ephesians 4:31-32 (NIV) when it says to "Get rid of all bitterness, rage and anger, brawling and slander, along with every form of malice. Be kind and compassionate to one another, forgiving each other, just as in Christ God forgave you." So that's what I'm gonna do here today. After contemplating fully what happened with all the benefit of 20/20 hindsight, I can say without a doubt that I was wrong and made several mistakes that unfairly put two very good people in the crosshairs of needless ridicule and scorn that they didn't deserve. I now know that I should have handled this situation with them privately, discussed the concerns they had, and then come to a decision about what to do based on those conversations. It was entirely my fault for not doing this and giving them the proper respect that they deserved. For that I am truly sorry and ask for their forgiveness. My intention was never to cause them harm and yet that is exactly what it did. They deserved better. Dr. Fung and Megan are two truly amazing people in the #ketogenic #fasting community and I am grateful to have had the opportunity to share a microphone with them on our podcast and called them both friends. Their knowledge, commitment, and passion for helping people is obvious to anyone who meets them and I am so proud of them for the great service they offer their patients at the Intensive Dietary Management (IDM) program. Within two months' time, Adam Nally D.O. would quit the Keto Talk podcast. By all indications, this was an amicable split, but in looking for a new co-host Jimmy marketed the only thing he's really got going for him: he can get you exposure. I have no idea how lucrative Nally's insanely overpriced exogenous ketone, supplement and Keto Klub (what's with the Ks? LOL) business brings him. Surely if it's going to be profitable, making a "name" for himself in the gullible keto community helped. Perhaps Fung's exit tipped Nally off to the reality that his association with Jimmy had already "paid off" as much as it was going to. What many don't realize is that Jimmy's co-hosts don't make any money from podcasting, and in the case of the two doctors, were the ones providing any meaningful content -- often over and despite Jimmy's annoying banter and antics. It's really a wonder Nally lasted as long as he did. While Nally didn't Fung Jimmy into a supporting "with" role, he did manage to climb atop the author credits. Of note they've added weight loss, cholesterol and thyroid to the list of "cures" while removing heart disease and cancer. I wonder what's behind that? In any case, we haven't heard nearly as much about Jimmy's stressful writing schedule taking a toll on his health this go round. This leads me to believe that as with the fasting book, it's really Nally who is doing the writing. Back to the time of all of the podcast drama, for whatever reason, around that same time, Jimmy Moore backed out of Keto Fest hosted by 2 [obese] Keto Dudes. 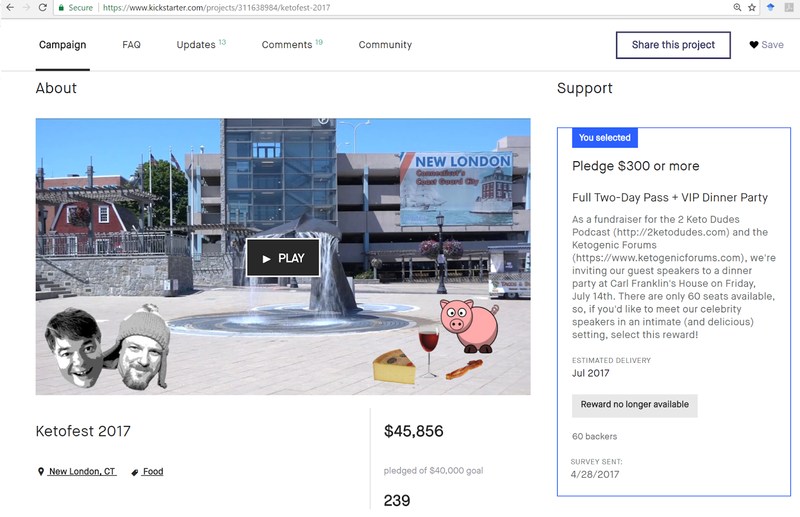 Keto Fest began with a Kickstarter campaign to raise $40,000 to fund the event. It was held in an area to which I still have ties and not all that far away. I couldn't resist the option to donate $300 that included an invite to the VIP party with all of the speakers. I could finally meet the big kahuna himself! Early on, a separate HEAL Care (one of Dr. Westman's businesses) "kickoff" event was scheduled at which Jimmy was also supposed to be a speaker. One of the two dudes (Richard) "outed" my donation on Twitter, and for a fleeting moment I actually wondered if Jimmy hadn't backed out because of it! He cited being travel weary, which was kinda ridiculous as his recent travels at the time consisted of a low carb cruise and maybe that's when he went to Vegas as well. Really, if your diet doesn't make you energetic enough to travel a few times a year without stress melt downs, that's yet another strike against promoting it!! (Speaking of 2KetoDudes, they are producing Fung's new podcast to promote his fasting cure for obesity and such). The KetoDudes were in no rush to update their websites and such when Jimmy made his decision. To the best of my knowledge, he wasn't really replaced. Something about KetoFest doesn't sit well with me at all -- and this is a bit of a tangent, but it is relevant to Keto Clarity Academy. As a fairly early donor, I kept tabs with donations to see if the event would run. The thing with Kickstarter is that if you don't reach your goal, the campaign fails and none of the donated monies are collected. There was a last minute "matcher" who ponied up like $4 or $5K if others donated. As you can see (click to enlarge) they ended up with $45,856 from 239 backers. If you subtract out the 60 backers at $300 for the VIP, that leaves $27,856 from the remaining 179 backers for an average of around $155 per backer. After Jimmy backed out, I looked at the remaining speaker lineup AND hotel rates in the area for the weekend (which were astronomical due to some big entertainment in town at the nearby casinos) and decided not to attend. I was refunded my donation. I did "attend" to meet with Dave Feldman (@DaveKeto) the day before as I had plans in the area. That was fun, and I intended to go to the HEAL event, but from the warmth of my jacuzzi tub on a dreary day, I just couldn't bring myself to pony up $50 to attend the event in the opposite direction to my other plans. I kind of wish I had, to gauge the vibe in the room for this event. There's video of it HERE (by the way, if you take issue with me calling them 2 (obese) Keto Dudes, here's a screenshot from that video). The reason I went off on the Ketofest tangent is that Melanie Miller, former Director of Engagement at HEAL, and her merry band of "green shirts" road-tripped from WVa up to CT for the event, and switched out those green Ambassador shirts for red Ketofest volunteer shirts. Melanie spoke at the HEAL event. I don't know what HC was paying Miller, but I got the distinct impression that the Ambassador parade at these various events were not being compensated. Perhaps they got put up in a hotel and had their gas paid in exchange for running the whole shindig, but very soon after this event, the entire team resigned. By all indications, they were taken advantage of and did all the work at KetoFest while the Dudes pocketed a lot of money. The pictures from that VIP dinner were of a few speakers and the HEAL gang, so I'm not sure how much of the $45K was actually collected, but this event cost a small fraction of that to put on, I'm sure of that. In what seemed like very short and hurried order, Keto Clarity Academy was born. Melanie Miller was CEO, Jimmy was routinely referred to as her "business partner" (and she in kind by Jimmy). 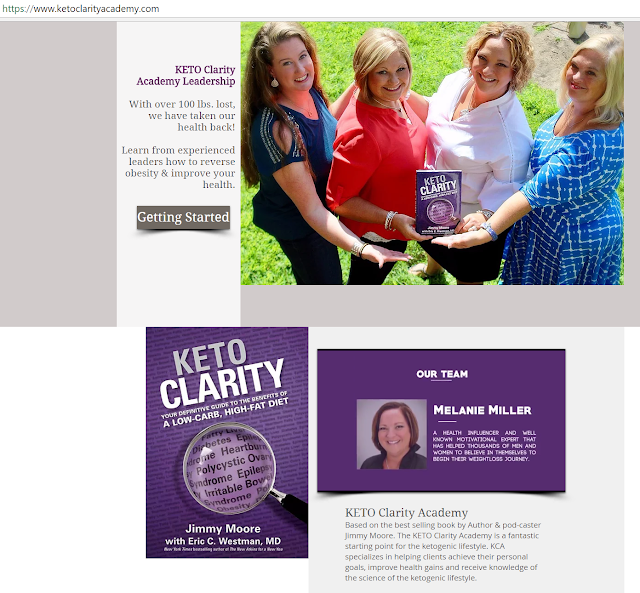 I blogged very briefly in this regard: Keto Clarity Academy ~ Medical Disclaimer. Some images from that post. 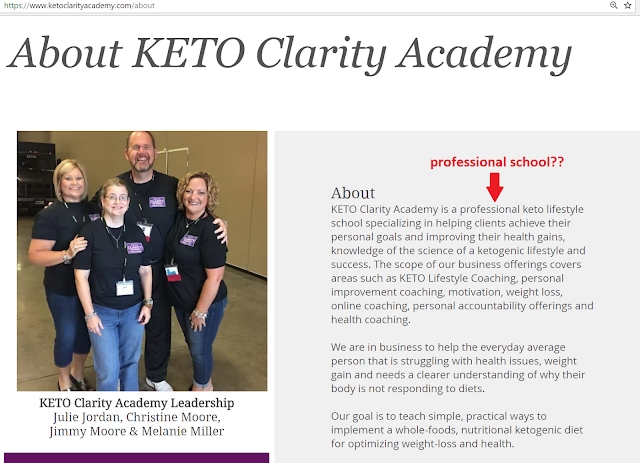 I think KCA only had three events (one was an existing LC support group meeting that became an affiliate) wherein they tried to sell their services of teaching people how to do keto, mentoring and support. The major problem with KCA was that nobody involved had any relevant background to be running such a "professional school". HEAL has a clinic/medical arm for those with diabetes and such, and is run by Dr. Westman and Atkins' nurse Jackie Eberstein. KCA had a book written by Jimmy Moore with a collection of quotes from dubious "experts" and inane doctor's notes by Westman. The second major problem is evident in the pictures. In a world where there is abundant, and often quality, information available for free on the internet (or in a book costing around $20), most people are looking for *services* to help them implement something for weight loss. And make no mistake about it, the vast majority looking to do keto are chasing the magical weight loss promised. In this regard, the ladies doing the teaching at KCA -- Cara Lloyd and Michelle Dorsey -- and the woman, Melanie, running the show are just not what most are looking for in this regard. Nevermind that if people actually READ Keto Clarity they are reminded that Jimmy Moore had to embark on his n=1 keto experiment to reverse regaining to over 300 lbs. They would then be further reminded and/or made aware that Jimmy Moore has regained all of the 80-odd lost pounds lost back 2012-13 (yes, 5 years ago at this time he was in the final stretch) and gained even more. On what planet do people pay these people to help them lose weight? 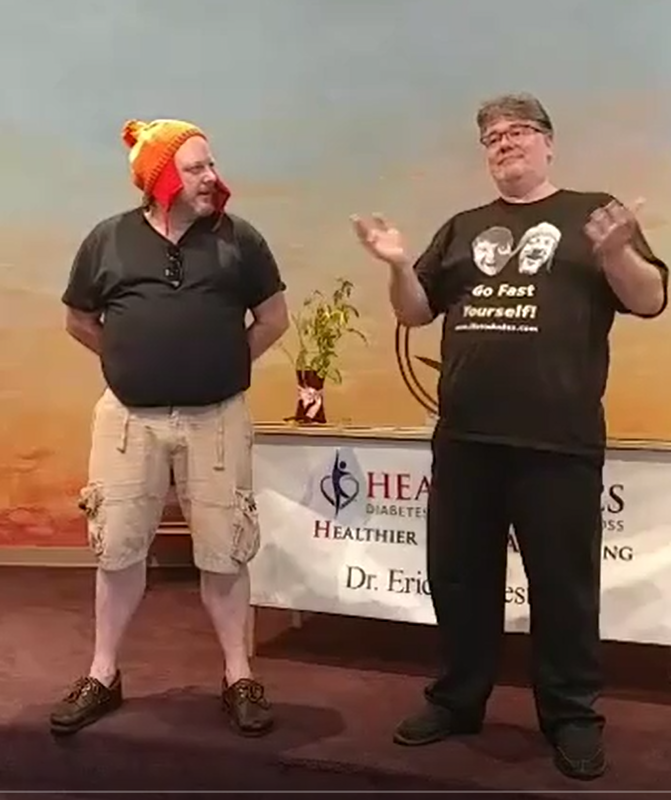 Melanie spoke at Jimmy's aptly named KetoCON in September, which is where the last image above is from, and the following two. KCA attire was worn to promote this venture. There was lots of talk of expanding nationwide with Keto Clarity Live events, and a podcast with Melanie to air on Mondays beginning in January. This all before the company's first event in early October. The bottom liere is that KCA was doomed from its inception. Despite his marketing "savvy", by all indications KCA was a flop from the get go. The pricing was almost immediately downgraded following the launch, something that's rarely done if sales/uptake are good. There was mention of disappointment in the turnout for that October event, but the big kahuna was coming in November! So attendees and followers were encouraged to sign up for that next event ASAP -- just a year before a larger venue event sold out in 24 hours. Only that event had HEAL behind it. Well ... the Healthy for the Holidays shindig never did sell out. *SOMETHING* happened surrounding that event. There were a couple of supportive messages posted to Melanie by her daughter and a long time friend, but notably absent were any of her Keto Krusader friends. Indeed they all unfriended her on Facebook as Melanie basically fell off the face of ... well ... Facebook. 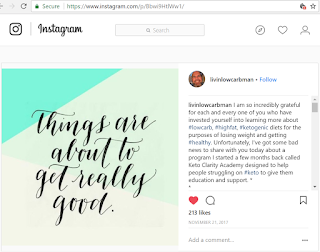 FULL POST: I am so incredibly grateful for each and every one of you who have invested yourself into learning more about #lowcarb, #highfat, #ketogenic diets for the purposes of losing weight and getting #healthy. Unfortunately, I've got some bad news to share with you today about a program I started a few months back called Keto Clarity Academy designed to help people struggling on #keto to give them education and support. **We’ve had some major changes happen in recent days that have forced us to make the difficult but necessary decision to dissolve that company effective immediately and I am no longer affiliated with it in any way. As you know, the work we were doing there was based on my international bestselling books Keto Clarity, Cholesterol Clarity, and The Complete Guide To Fasting and the teachers and mentors have been doing a fabulous job making keto so much easier to understand for people just like you. All of your favorite teachers, mentors, and even myself are preparing a brand new venture to offer YOU the very best education and support for your ketogenic lifestyle that you’ll find anywhere. If you’ve enjoyed what you’ve been experiencing with KCA so far, then you’re gonna LOVE LOVE LOVE what we have for you in this new venture coming soon (shhhhh, it’s a secret!). More details coming soon. In fact, we’re adding to the existing curriculum that you already enjoy to give even more support for the mindset piece in all of this which is so critically important. And with two new books (Keto Cure in February and Keto Freedom in April) coming in the first half of 2018 from me, we’ll likely be incorporating principles from those as well into the curriculum. Things are moving forward with the intent to keep the education and encouragement going. As you can see, truly exciting things are happening and we’re overjoyed to have you come along for the ride with us. Thank you again so much for your support of the work we are doing and we so much look forward to serving you well in 2018. I'll be updating you when the time comes to share about this incredible next chapter. Stay tuned! Not long after this, in his inimitable low class fashion, Jimmy Moore posted a picture of Melanie Miller behind jail bars and leveled some pretty serious allegations across his social media platforms ... specifically Instagram, Facebook (both public), and his now-secret Keto Talk FB group (with around 20K members). I'm not here to carry water for Melanie Miller, but this little stunt was a new level of low in Jimmy Moore's lack-of-professional behavior. Putting a profile picture behind bars is over the top even for him, so I won't include that image, but below is a screenshot of the full original post. Almost instantly upon getting criticized (including by me) for the impropriety of this post, Jimmy deleted it from Instagram, to later be replaced by this milder version. (The original did remain in his Keto Talk group). Melanie Miller engaged in questionable practices with KCA ostensibly for her own personal purposes. When I learned of these practices, I was appalled. I parted ways with her and KCA in mid-November and she was supposed to refund everyone who had paid for services. Unfortunately, many of you have written to me stating Melanie has never responded or even outright denied your request for a refund. That is atrocious and I'm so sorry she did that. You can email her directly about any remaining money you are owed at melaniemillerconsulting@gmail.com. 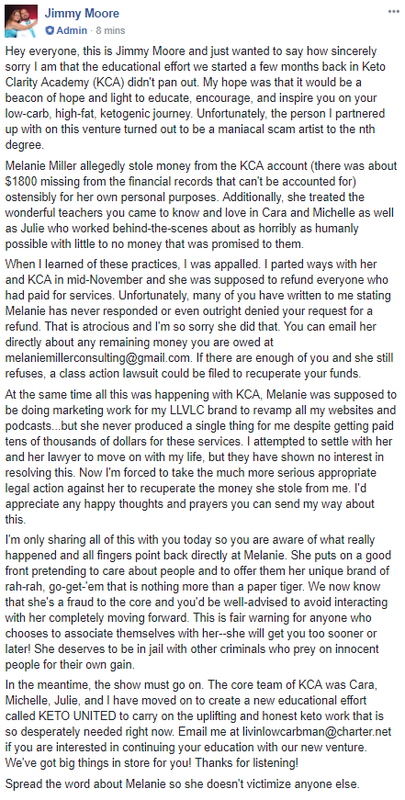 At the same time all this was happening with KCA, Melanie was supposed to be doing marketing work for my LLVLC brand to revamp all my websites and podcasts...but she never produced a single thing for me despite getting paid tens of thousands of dollars for these services. I attempted to settle with her and her lawyer to move on with my life, but they have shown no interest in resolving this. Now I'm forced to possibly take the much more serious appropriate legal action against her to recuperate the money she stole from me. I'd appreciate any happy thoughts and prayers you can send my way about this. I'm only sharing all of this with you today so you are aware of what really happened and all fingers point back directly at Melanie. She puts on a good front but she’s not what she claims to be. There are so many things wrong with taking this course of action, even the much watered down version, it's hard to know where to start. Whatever happened, there's no evidence that Melanie Miller has some sort of history scamming people out of money, which is really what Jimmy is trying to imply with his "public service announcement". This leaves the issue of monies owed to KCA clients for undelivered services. I have no idea how much this is, and tend to think that it's not a whole lot if any at all. Their classes were short, and packages were for a month at a time. If they had a sufficient number of clients to make the sum considerable, KCA would probably still be in business. So I tend to think this is more hot air and posing than any real issue. In any case, Jimmy Moore, Cara Lloyd, Michelle Dorsey and Julie Green are demonstrating extreme lack of business etiquette with their "ask her for the money, we've washed our hands" attitude. Nothing says "we're not interested in your business in our new venture" dirty laundry of personal conflicts and abandoning clients of an old one. Furthermore, since it's still "all the same", they would not need to shell out one additional dollar to make good on undelivered KCA services by offering those services (free) through Keto United. That is, of course, if there actually were clients. Whether or not they are directly responsible for the dissolution of KCA, or technically legally liable, these are clients they had a hand in recruiting. When these clients could be made whole without spending more than a little time, it says a lot about these people. It could only have been a plus to grow their client base were they to have offered to make good. There's no downside. So it's just bad -- very bad -- business practice. And that brings me to the third part of Jimmy's complaint, one that has nothing to do with KCA. Separately and apart from KCA, Jimmy claims he gave Melanie "tens of thousands" of dollars for publicity work to revamp his brand. I do not believe that even Jimmy is this stupid. Firstly, I find it hard to believe that he hired anyone in this capacity, let alone someone with no discernible online presence/portfolio for doing such work. And big-IF he did actually hire her to revamp his brand, was he really so stupid as to give her at least $10K up front? No ... you sign a contract, and you pay in predetermined installments as services are completed. And yeah, if the contract is breached, then you go to court, not splay it all out on social media. But ... if you make vague but insidious accusations on social media and never go to court, there's no way to be proven a liar on this point. I repeat. I'm not here to carry water for Melanie, she's got considerable credibility issues for photo shenanigans and weight loss claims. Scam artist out to bilk good keto people out of thousands of dollars for personal gain? I'm not convinced. Meanwhile, Jimmy Moore has a long history of lying and overdramatizing, I tend to disbelieve pretty much anything he says. 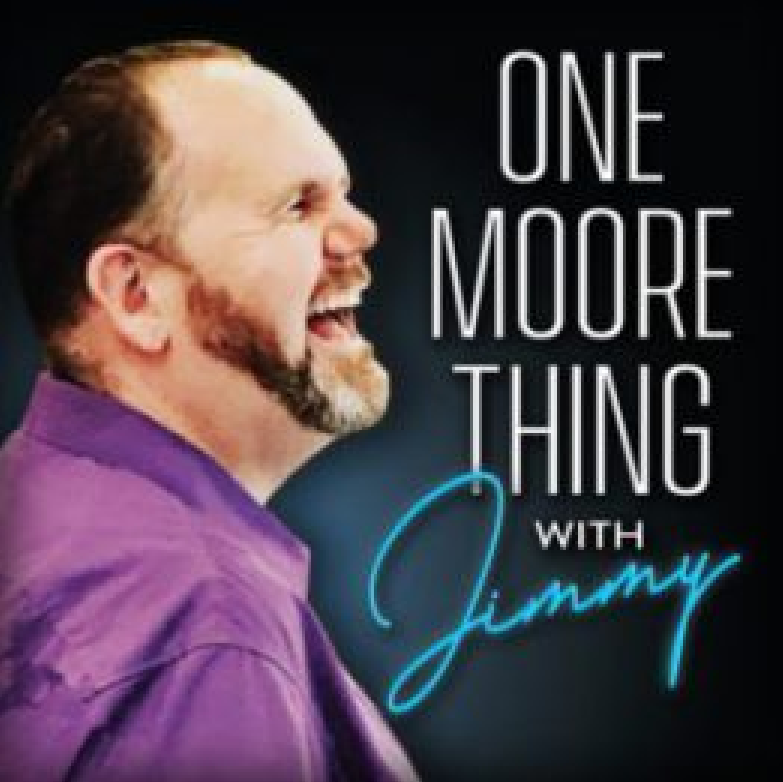 In any case, with the void of Melanie in the podcast schedule, Jimmy Moore launched the Nutritional Pearls Podcast with his wife: Christine Moore NoT a Practitioner. Fresh from completing a program in nutritional quackery that includes such books as 7-Day Detox Miracle, The Big Fat Surprise, Adrenal Fatigue, Why Stomach Acid is Good For You, and Nourishing Traditions on its required reading list, The show notes from the first few podcasts read like the outline of the course. I predict this won't last unless there are enough highly visible NTPs they can get to come on as guests to bring their followings and sponsor $. Taking this non-academic program does not qualify her in any way to dispense nutrition information. I think this review on iTunes sums it up! His latest episode is on Dealing with Online Haters. He's been bitching and playing up that angle more and moore lately. It seems that in Jimmy's case, he has more to deal with these day in terms of "haters" within his community than from without. He's become more and more a liability to "the cause" and his broken victim record is not playing so well anymore. I continue to be amazed he's lasted this long. So yeah, this "hater" (LOL) will perhaps have more to say another day.